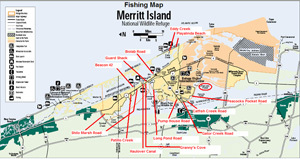 Together the Merritt Island National Wildlife Refuge and the Canaveral National Seashore provide many square miles of some of the finest Backcountry saltwater fishing for Redfish, Seatrout, Snook and Tarpon available in the state. (Click map to see larger version) The Mosquito Lagoon in particular has wide expanses of some of the most pristine grass flats in the state. However there are also canals, impoundments, mangrove shorelines salt marshes creeks and even some freshwater barrow pits that offer great fishing on the refuge by foot, boat, and paddling. If fishing by canoe or kayak please keep a sharp eye on the weather and wind conditions. The Indian River and Mosquito Lagoon are both wide expanses of water and unexpected or unplanned for weather conditions can place you in danger. Before you fish the refuge, please note the permit requirement just below. NOTE; Free Fishing Permit Required! Beginning February 1, 2009 any person fishing on Merritt Island National Wildlife Refuge without a signed FREE refuge fishing permit will be cited. The fine for violating the permit requirement is $125.00. The permit is required for ALL fishermen - those fishing from land and those fishing from a vessel in refuge waters. You can pick up a permit at two information kiosks located at either entrance to the refuge or you can download it from the link above. Once you have your fishing permit, read it, sign the business card sized permit and keep it in your wallet. The primary purpose of the permit is to ensure that all fishermen and women are aware of the fishing regulations that apply to the refuge. The page you download will have a fishing map, refuge specific regulations and two permits. 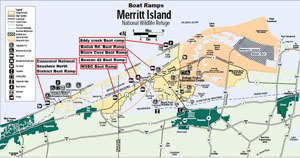 There are a total of six boat ramp areas within Merritt Island National Wildlife Refuge and Canaveral National Seashore. (Click map to see larger version) Five of them are on the Mosquito Lagoon and the fifth is at Blairs Cove off of Haulover Canal. All except the Canaveral Seashore North District boat ramp are easily accessed from the Titusville Entrance to the refuge. One of my favorite ways to fish the lagoon is by canoe or kayak. There are four designated canoe launches out on the refuge and seashore property. Three of them are on the Mosquito Lagoon, Beacon Road Boat Ramp, Biolab Road Boat Ramp, and Eddy Creek Boat Ramp. A forth exists at Dummitt Cove and provides access to the Indian River Lagoon. The cove itself can be very good fishing. Click here for more information.However, the general rule about paddling the refuge is this. You can not launch from Black Point Wildlife Drive or any road connected to it except Long Pond Road. You can not launch or paddle inside the mosquito impoundments. Other than that, if it is open to the public and you can get your boat to it you can launch from it. This includes any dike road open to traffic, or if you should be so inclined to outfit a mountain bike to tow a kayak, any of the roads listed below. Some good areas are Pucket Creek off Pumphouse road where you will have to carry the boat about 50 feet to the water, West Gator Creek Road, Catfish Creek Loop, Peacocks Pocket Loop, Biolab Road, the Guard Shack Road, the northeast corner of Haulover Canal, and the Patillo Creek Area of Shiloh Road (see "The Dike Roads" just below for graphics). There are many miles of dike roads on the refuge and some of them are open to visitor traffic, while others have been closed off to motor vehicles. The refuge occasionally decides to close certain dike roads to motor traffic for several reasons, deteriorating road conditions, The presence of certain species of birds during migratory periods, or problems with littering or other issues. However, unless otherwise specifically posted as no entrance beyond this point, barricaded roads are still open to foot and bicycle traffic. For those who are willing to pack their tackle on their person or mountain bike, it is possible to find excellent fishing opportunities that have not been disturbed by recent activity. The Pumphouse Road loop is a quick drive from Titusville only about a half mile into the refuge and will be the first left turn after the entrance. Formerly you could drive the entire loop with your car but it has since been closed off to all but foot and bicycle unse.to Trout can be had from the roadside canal just past the open cove up to the pumphouse. I've used live shrimp, plastic baits and the original Rapala balsa minnow with decent results with the latter being my favorite. Up past the pumphouse used to pump water from one side of a refuge access road to the other, I've jumped an occasional small tarpon, seen plenty of others rolling but not hitting, and caught trout on rapalas and live shrimp. The roadside canal that extends Northeast from the pumphouse seems to be pretty shallow and is very brushy on both sides. You can also hike or bike the dike path that extends from the pumphouse itself to the lagoon where there is a possibility of enticing early morning topwater action for seatrout or redfish. or along the opposite side of Puckett Creek from where you park. The Creek Roads; Gator Creek and Catfish Creek;There are essentially three sections here that connect to each other starting right at the entrance to the refuge from Titusville. The first section is commonly referred to as West Gator Creek Road and can be accessed from the west end of the Max Brewer Causeway at the entrance to the refuge and just outside of Titusville City Limits. You will see a small paved parking lot with an informational kiosk and the entrance to the road at the west end of the parking lot. There are some dips in the road but with care it should be no problem for an auto. The first leg along the lagoon is very shallow for fishing from the shore. You would have to be able to cast a pretty good distance. However, a canoe or kayak can be launched here and decent flats fishing can be accessed just offshore. After the road turns to the left, it runs along gator creek for about a mile and the water is deep enough to fish from shore. As the road turns back towards Max Brewer Parkway you will see a connection to East Gator Creek Road. Catfish Creek Loop; To get to Catfish Creek Loop Road, it is best to take SR 406 to the second entrance of East Gator Creek Road and turn left. Follow this road and take the first left onto Gator Creek Road. This will turn south then abrubtly turn southeast for about .3 miles followed by a turn to the northeast after which you will see a right hand turnoff. Take this and it will almost immediately turn you to the southwest and to the entrance of Catfish Creek Loop. By staying to the right, The first section allows you to fish the oposite bank of Gator Creek until it reaches the Indian River Lagoon. Then there is a small section along the lagoon with decent flats fishing until you get to Catfish Creek. The road then turns to the north at the mouth of Catfish creek until the creek runs out. The end of the loop as well as the intersection for Peacocks Pocket road (to the right) are just ahead. Peacocks Pocket; There are two ways to get to Peacocks Pocket. One is to take the eastern leg of the Catfish Creek Loop and then take the first left which will take you along the eastern shore of catfish creek to the lagoon then turn southwest along the lagoon, around a smaller cove and then around Peacocks Pocket right before turning due North to take you straight to SR 402. The other way is of course to take 406 to 402 until you pass the Refuge Visitors Center. After passing the center, look for Peacocks Pocket Road on the right and drive due south until you get to the "Buzzards Roost" an old radar tower. Due not park too close to the water here as it is easy to get hopelessly stuck. launching a canoe or kayak puts you on some very good flats for reds and seatrout. Paddling North, you'll come to the mouth of Banana Creek. This is Kennedy Space Center property and entry is prohibited into the creek. Do not think you can slip in for a quick paddle. Trust me, they see you, and you are on camera. There is however a trough or channel leading into the creek and during the cooler months this channel produces fish while the flats will become alive with fish as the weather warms. Long Pond Road; As of this writing Long Pond Road is closed to motor vehicle traffic due to hurricane damage and a lack of funding to fix it. However it is still open to foot and bike traffic. Long Pond Road provides about 5 miles of fishing access, with several good canoe/kayak launch sites along its run where the road is wide enough to park and a decent launch beach present. Long Pond Road can be accessed from two points. 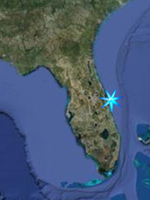 The closest to Titusville is off of Black Point Wildlife Drive near the end of the drive. The second entrance is about 3 miles or so north of the intersection of SR 406 and SR 3. Remember though that by going to the Black Point entrance you have to drive through about 4 1/2 miles of Black Point itself, before you can even think about fishing (No fishing or boat launching allowed off of Black Point). In addition you have to understand that Black Point is a world reknowned birdwatching site, complete with birdwatchers from all over globe who like to stop and watch birds while at the same pumping more dollars into our local economy than most people realize. If fishing is the purpose of your visit, the SR-3 entrance is the better choice and will get you fishing faster as it quickly skirts the southern shoreline of Dummit Cove. This can be a great fishing spot from the dike itself for trout and reds. In fact some very big reds have come from the cove, usually from boats but anything is possible. After it passes the mouth of the cove it runs along the Indian River Lagoon. These are waters more suitable for wading or canoe/kayak fishing than shore fishing as it is very shallow along the dike. However it does seem to be easily waded with a firm sandy bottom and nice grass flats. Do the stingray shuffle (see "The Dike Roads" above on this page) and start fishing in about knee depth or slightly less water, which isn't very far offshore. The road then turns south runs along a channel that enters a cove. You can fish from shore along the cove. The road then quickly makes the connection to Black Point where you can turn left and join the birdwatchers making their exit. Be careful entering Black Point as there is a blind turn right before the birders reach the intersection and they may not see you entering. Dummit Cove; About four miles north of the intersection of SR-406 and SR-3 on the left (west) you will see a sign for the Sendler Education Outpost and the entrance to Dummit Cove. There are several spots for shore fishing here but this is a great place to launch a canoe or kayak in to paddle and fish as the seagrass beds are quite lush in places and there are some red mangroves to fish as well. I have fished here a few times and have had success with trout but I also know some big redfish in the 40+ inch range have been caught here. The deeper channel leading out the mouth may be worth a try in cooler weather periods with jigs and plastics. Biolab Road; About two miles north of the intersection of SR-406 and SR-3 you will see a building marked as NASA's Atmospheric Sciences Laboratory. The dirt road beginning here is called Biolab Road and runs down to the Mosquito Lagoon where there exists a boat ramp and parking area. It then runs along the lagoon south until it reaches the Playalinda Beach access road. Right before you get to the boat ramp parking are you will see a canal. This may be the orginal Haulover Canal that predates the present day one farther north. 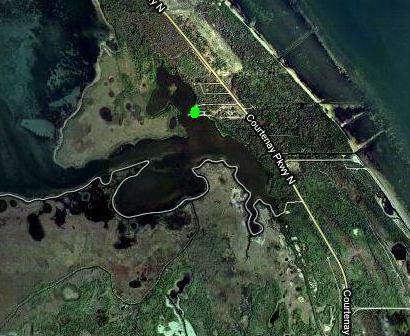 If canoe/kayak fishing, put in here at the canal and paddle out the mouth of the canal east into the mosquito lagoon. Turn to the left and follow the shoreline until you come to a small island and fish the flats around the island. I've had some great days here for redfish. You might also try the canal itself in the spring and summer for snook and tarpon. Farther south on Biolab Road it passes the whale tail flats. These flats are about a mile offshore and hold a unique population of very large redfish. These fish are regularly hammered by professional guides and are very wary. If you fish bait for these fish please use circle hooks to help ensure a successful release. Farther South, towards the end of the lagoon you will see Pelican Island offshore. There is a deeper area on the west side of the island that holds redfish and seatrout in the cooler months and even reportedly some large Tarpon in the early spring. Guard Shack; I call this place the Guard Shack because there used to be a Space Center Security Guard Shack that I used as a reference to find the road. If it has an official name, I don't know it. The guard shack road is no longer there but the concrete foundation remanains and can be seen about a mile south of Haulover Canal. As of this writing I have fished the place once, with live shrimp under a cork and I did catch several redfish, and I have heard from another source that small tarpon can be hooked in the creeks or canals south of the cove. I have yet to explore the immediate area by canoe but based on this aerial photo it certainly looks interesting. There seems to be a deeper channel right along the shorline north of the opening to the canal with the cove that leads to several other canals running parallel to each other. If these canals have any depth to them they could hold small tarpon as I have found tarpon in similar situations elsewhere. Granny's Cove; I'm not sure where the name Granny's Cove comes from or even if it's the real name of this place but this can be a pretty good place to fish. It is immediately south of Haulover Canal. Look for the entrance shortly after you pass the Guard Shack mentioned just above. You used to be able to drive out onto the island but it has recently been barracaded off to vehicles. However, it is still legal to park near the barracades and either hike or bike into the area and the fishing here can be pretty good for seatrout after cold weather has set into the area. As the image at left shows this is an island carved out of the natural shoreline with canals on three sides and the lagoon on the other. I've caught trout in the canal opposite the river and in the river from shore at this location. Fish the canal in the cooler months by finding an open spot in the shoreline trees. Don't cast straight out but at an angle to work your bait or lure about 8 to 10 feet offshore of the trees. I usually do this with a live shrimp 18 to 24 inches below a cork but I have used jigs, spoons and other lures in similar situations with good results. In the warmer months try the riverside. Here there is a trough or area of deeper water running along the shoreline, then shallow flats farther offshore. Work baits and lures close to the flats in the trough. Haulover Canal; Haulover Canal is the only connection between the Indian River Lagoon to the West and the Mosquito Lagoon to the East and is one of the area's most popular fishing spots especially for those fishing without the benefit of a boat. It is deeper than about 90% of the lagoon and lined with rocks overshadowed by trees along the shoreline, which provide cover and structure for many species. There are some large redfish in the canal as well as Seatrout, Black Drum, Mangrove or Grey Snapper, Sheepshead, Jack crevale, Bluefish, and the occasional Snook and Tarpon. Fish along or just off the rocks or cast into the channel itself. I usually either freeline a shrimp along the rocks or if fishing the channel, out a split shot or small sinker 18 inches above the hook to get the bait deeper into the channel. Near the ends of the canal can be especially good places to channel fish and Haulover is one a those places where you never know quite what will hit next. If canoe or kayak fishing drift with the current and work the shoreline, being careful to respect those fishing the shoreline, (they don't have the options you do) and be careful of the boats passing through. Heading North from Live Oak on SR-3, Patillo Creek Road is the next entrance to Shiloh Marsh Road and goes from the Patillo Creek Area and winds along the dike impoundment out into the lagoon itself while circling around several coves before making its way back to SR-3. There are about 3 1/2 miles of shore fishing and kayak/canoe launching opportunities along this road and while I haven't fished this road yet some of the coves and the area near the outwardmost tip look very inviting, especially the islands off of the tip by kayak. Eddy Creek has a boat ramp and offers paddling access to the southernmost reaches of the Mosquito Lagoon. To get there, take SR-406 to SR-402 (Thats where the road veers to the right near the turnoff to get to Black Point Wildlife Drive.) Go past the Refuge Visitors Center and continue to the intersection of SR-402 and SR-3. Go straight ahead at the light and follow the road through the pay station for Canaveral National Seashore and all the way to the beach access road. Heading north, you will find the parking area for Eddy Creek on the left side of the road just after beach parking area # 7. There is a dock for fishing at the park as well as some easily walked shoreline along the southern edge of the cove. Fish here with live shrimp for reds, trout, and a variety oif other species such as mangrove snapper, sheepshead, drum etc. If paddling, fish both in the cove and out of it on the lagoon. Outside the cove you will see Pelican Island to the southwest as well as another smaller island almost due south. Fish the flats around both islands for reds and trout. West of the larger island, pelican, you will find a deeper area that can hold reds, trout, early spring tarpon and a variety of other species.